This is my Lab Rat series. I call this one Lab Rat Freddy. It incorporates a vintage lab stand, vintage clamp, and a vintage flask. All parts have original finish washed. Light bulb is a standard base tube bulb 25-watt. 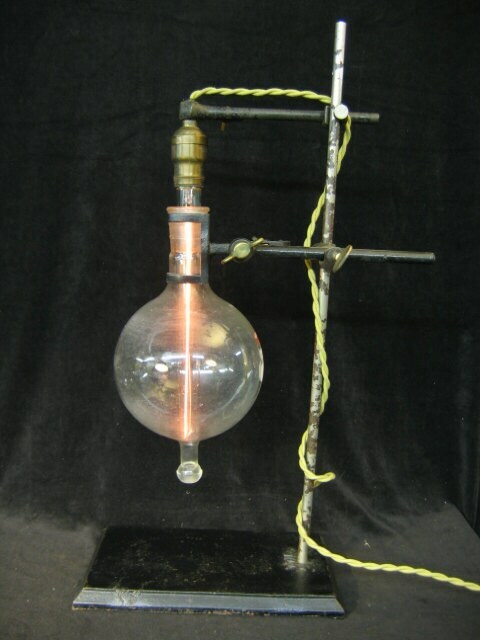 A special feature of this light is that the flask has some wonderful internal etching and the bulb filament vibrates from the slightest vibration in the room. Base: 6 1/2" X 10 3/4"